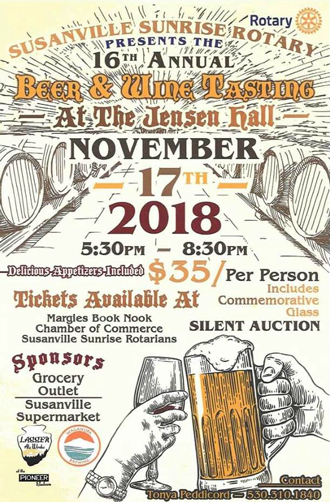 Susanville’s Sunrise Rotary Club is hosting their 16th annual beer and wine tasting fundraiser on November 17th, and we have a pair of tickets to give away! Always a good time, the beer and wine tasting gives you a chance to sample some great beverages and phenomenal hors d’oeuvres along with a silent auction and splendid door prizes… all for a good cause! Money raised by the event will go to help out with the myriad projects that Sunrise Rotarians undertake locally each year; Scholarship Awards; Local Music and Speech Contests; Sober Grad T-Shirts; Local Library Literacy Program; Rotary Eighth Grade Leadership Camp; Camp RYLA; Lassen High School Interact Club; Eagle Scouts; youth projects; donations to other local community organizations and a lot more. In past years Sunrise Rotary’s major projects have included new windows at Camp Ronald McDonald at Eagle Lake, hearing testing equipment for Sierra Cascade Family Opportunities and a major donation to reconstruct the roof at Roop’s Fort in Uptown Susanville. The wine tasting will be held from 5:30 to 8:30 at Jensen Hall in the Lassen County Fairgrounds. Tickets, which include a commemorative wine glass, are $35 a person and are available at Margie’s Book Nook, the Chamber of Commerce, from any Susanville Sunrise Rotarian or at the door. 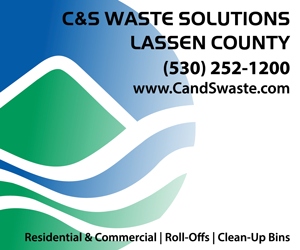 The event is being sponsored by Grocery Outlet, Susanville Supermarket, Lassen Ale Works at the Pioneer Saloon and Waganupa Brewery. 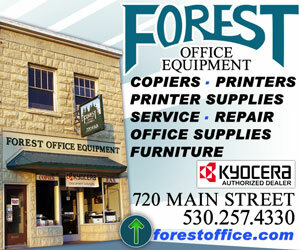 For more information contact Tonya Peddicord at 530.310.1840. Want to Win Tickets? Of Course You Do! To attend the wine tasting you must be 21 or older. You can enter once per day, per email address, from now until midnight on November 15th to win a pair of tickets to the wine tasting. We will announce the name of our ticket winner right here Friday morning, November 16th. No purchase necessary to enter and win. Contest ends at 11:59 p.m. (PST) November 15th, 2018. All entries must be received before 11:59 p.m. (PST) November 15th, 2018 to be valid. To enter to win our SusanvilleStuff giveaway, please fill in the required information in the form above. Incomplete entries are considered void. This contest is open to all legal residents of the United States, 21 years and older. Those who enter this contest acknowledge the official rules, requirements and eligibility.